Creeping on the blogosphere lately has been this ah-maze-ing competition to win a whopping £500 to spend at Fashion Union. As you know I’m a complete sucker for any kind of competition so having the chance to win such a massive amount of money on one of my favourite online stores would be pretty awesome!! And entering is easy as pie – you just have to make a wishlist!! Fashion Union has so many steals – I can’t believe how cheap the Jeffery Campbell Contrane boots are!! They’re not only cheap but on top of the trends, how gorgeous is the Tartan Skirt?! 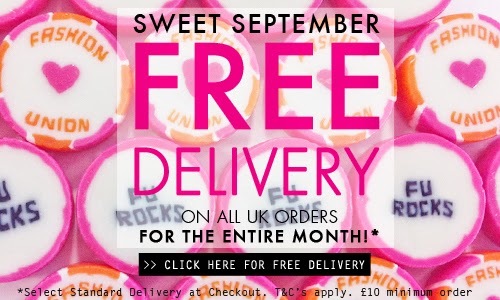 To make things even better (yes, it’s possible), Sweet September is currently running meaning it’s free deliveries! Click on the image below to be redirected to the site.. If you fancy entering – you’d be mad not to, you can do so by clicking here. Be quick though as the competiton ends on Monday!! "You’re gonna hear me roar"